Following the widely acclaimed releases of Fouk & Kito Jempere, our autumn release is nothing but a strictly family affair. 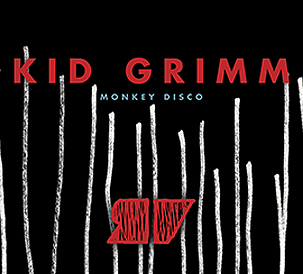 Kid Grimm is indeed a brand new alias of our dear friend Alland Byallo, longtime collaborator of the label both for his production & awesome graphic works. With an impressive discography crossing over quality imprints such as Third Ear, Bad Animal, Real Tone or Rawax, the San Francisco born and Berlin resident always got something exciting coming out of his machines. Being always one of the very first lucky ones to listen to his fresh material, Dairmount discovered one year ago a bouncy little tune called Monkey Disco. He instantly felt in love with the hybrid mixture of catchy “bumpty bump” basslines & chords and the lose synths wizardy of Alland. A surprisingly timeless vibe that could have been blessed by an imaginary collaboration between Derrick Carter and Floating Points. It took one more collective mixing session at Sasse’s Blackhead studio and the expert mastering of Atjazz to put the final touch to this very first Kid Grimm single. And as great minds never come alone, Dairmount offered to one ilustrous label fan to revamp Alland’s track. The man who instantly approved the original was none other than Deep House legend Charles Webster and he delivered amazing perspectives reminiscent of the universe of abstract House geniuses as Dj Koze or Pépé Bradock. The Charles Webster Afrospace Dub is dope !! Charles did it again! Both bersions are great, but the dub is my fave here. Superdope and atmospheric. Killer! Really feeling this release a lot, subtle & deep. I like the original as much as the CW remixes. Nice release here, liking the chilled synthy touches of the original and Charles Webster Perspective. Cool stuff. Should find a place into my radio sessions for sure. Played the original in the Smugglers Inn Show once I got it. Great Stuff! Super quality by RWAV as always! Lovely trippy hypno house, perfect for me the original mix. Charle’s mixes are predictably great also, fine work on this, will support on the show for sure. Love the original, good late night Food inspired spaced out house that keeps going for ever and ever. Kudos for the Charles mix too, rarely hear a bad remix from this chap!